What is your definition of good architectural design? Good Architecture is a combination of many things. Most prominently among them is good technical design, a sense of poetry about the form, and a resulting sensory response from the act of engaging the built environment. When architecture embodies these ideas, it is more than just a place or a building, it begins to become unique and makes a positive impact on our everyday lives. Good technical design encompasses the science of materials and how they are used efficiently and effectively. Poetry in the form is really about how the materials begin to connect and interact with light, and shadows, or create rhythm or tempo in the shape. Lastly, the impact on the human form when the built environment is experienced is crucial to making good Architecture. This includes the feel of the materials when they are touched, or the sense of scale of a structure or space when it is entered or passed by. The result is response that Good Architecture makes us feel good, or inspired. It goes without saying that Good Architecture can be possible on a small budget or unlimited budget, but so can bad Architecture, so neither is the sole determine factor on what determines good architecture. What is important is the resulting value from the investment in good design and good architecture. Good architecture design is also a reflection of the experience, understanding, and creativity of the Architect, and the influence and inspiration of the client. Good Design is important to me and our firm. It is a responsibility as Architects and designers we owe our clients who engage us and pay us for that service. Two years ago we purchase a vacant building in downtown Topeka, KS at 906 S Kansas Avenue that was formally the Shawnee Federal Savings and Loan building. Thru years of being vacant and neglected, the building was getting close to being ready to be torn down. We saw the opportunity to re-purpose it thru considerable renovation into a new home for our design firm. It was not easy, but is was very satisfying to blend new with old and create good Architecture out of a bad situation. Relocating our firm downtown has been inspirational and excellent for the work-create culture we are developing at Architect One. Architect One has been involved in some exciting architecture projects lately that are being built or in the design phase. Located at the corner of 37th and SW Fairlawn, we recently finished a new dentistry building for Dr Browning and his practice called “Sunflower Smiles”. The design team included myself and my associate, Cassandra Taylor. Dr Browning was looking for a building that would well designed and instantaneously recognizable and associated with his dental practice Sunflower Smiles. My business partner Michael Wilson and associate Cassandra Taylor are working on the Fellowship Bible Church project that is under construction at SW 10th Street and Urish Road. The contemporary design for this major construction and renovation will be dramatic both inside and outside when its complete. My associate Andrew Wiechen and I are currently working on the designs of the new Hotel Cyrus, a 100-bed boutique hotel which will be located in downtown Topeka. This much needed project will bring an exciting merge of both new, contemporary architecture of the tower and the rehabilitation of the existing late 19th century mercantile storefronts that are on the site. Another exciting project we are working on is the USD 501 TCALC Facility that will move into an expanded and renovated building on the old State Hospital grounds. 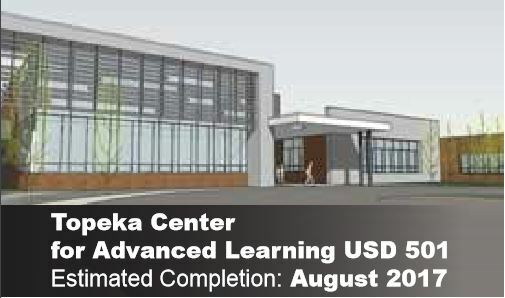 My business partner Michael Wilson and our associate Bryan Falk are leading this project which will be a state of the art advanced learning facility for students in the USD 501 school system. What architect or architectural building(s) have inspired you the most? I found and developed my passion for Architecture in the era before the Internet. I like to sketch a lot when I was little. To keep me busy when we would go places, my Mom would give me a pencil and a note pad and have me draw. I especially like to draw the rooms or buildings we were in or nearby. Since I grew up in smaller communities in Kansas, I didn’t have the influences of living near architecture of the big cities. My influence was the 1968 version of the Encyclopedia Britannica we had at home. Purchased by my parent when I was born, by today’s standards, it was ancient at 14 years old when I when to High School. Yet, that set of encyclopedias, were the door to learning about architecture, history, art, and the world beyond my horizon. Growing up without the instantaneous satisfaction of the internet, Google Earth, Wikipedia, Bing, etc meant the search or study of Architects and Architecture in my encyclopedias or the school library was more about the past than it was experiencing the present or future. I had a passion for history, including Architectural History. What I did know about Architecture, was that I was fascinated by “Falling Water”, the residence designed by Frank Lloyd Wright that was built in Mill Run, Pennsylvania in 1939. I was amazed at the Art Deco style used to give the Chrysler Building, designed by William Van Alen and built in New York City in 1930, its recognizable look and appearance. I was also intrigued by the modernist ways of Le Corbusier, and buildings he designed like the catholic church, Notre Dame du Haut, in Ronchamp, France (1955), or Villa Savoye, a modernist residence building in Poissy, France (1931). Those were the buildings I found in our dated encyclopedia set at home. The school library encyclopedias were newer and they had a few books on Architecture, but they didn’t have much of anything from the current times. Yet, these limited sources combined with some high school drafting classes were enough to drive my interest to become an Architect. In college and soon after, when I had the opportunities to travel, including an extended travel thru Europe and the United States, I was able to visit, experience, and learn much more about the amazing variety and history of Architecture and the built world. This reaffirmed my decision to become and Architect. And yes, I have since had the opportunity to visit Falling Water, the Chrysler Building, Notre Dame du Haut, and the Villa Savoye in person, and savored every moment of the experience. What trends are you seeing in architectural design? Stylistically, architectural design trends are all over the place which brings a very democratic core to Architecture. There are still regional, climatic, and cultural influences on Architectural Design, but our ability to create an ability to experience Architecture almost anywhere in a virtual reality-like way has changed our profession considerably. No one style is enforce or controlling the marketplace of ideas. Additionally, we are in a generational and cultural transition in our society. An older, aging boomer population is stepping back, retiring, and enjoying the fruits of their lives. A newer, tech-savy generation is entering the workforce and not accepting century-old standards outright, since many were born after the technological shift began. In the middle is a generation that grew up in the infancy of the tech-society, learning with the paper and pen, but has promoted and led the constant technological change that has enveloped the modern civilized world. This quickened pace of cultural transformation in our modern society is having a dramatic influence in the design profession, and in Architectural design. Pen and paper was replaced by desktop computers. Those in turn are changing as a newer generation uses laptops, smart pads, and smartphones. The use of digital design known as BIM, or Building Information Management, is transforming the way we design and build and the speed in which it is done. The use of 3D cad software like REVIT allows an Architect to design the building in great detail in three dimension which allows for creative freedom and attention to detail like never before. Combined with an emphasis on sustainability, and flexibility in the use of material, as well as technology, BIM or 3D design is creating more opportunities for an Architect to emphasize the quality of the built space and explore the functionality of it long before it has to be built. The level of detail also allows the Architect to team with Engineers and the Builders at a higher level earlier in the process. This brings greater value to the owner because more detail and a better understanding of construction cost and schedule mean projects can be completed sooner and with more confidence in the end result. Building design is transforming quickly as a result of the rapid technology evolution. New and more efficient uses of traditional materials are resulting in modern styles that have emphasis on detail and quality of spaces created on the inside. Efficiencies in the process are allowing for focus to put on sustainability and conservation in materials and methods of the building construction, as well as with the long-term operation and care of it. This has also lead to a resurgence in renovation and rehabilitation of older buildings when adaptation can efficiently accommodate the modern needs and functions of todays society. What trends are you seeing specifically in workplace design? Flexibility. Every generation wants to influence the way in which we work and play. There is a school of thought that feels that the open office environment is the way of future design environments. This is common among Millennials, who are used to existing in a more “social” work culture. You are seeing a trend of low-wall work environments where everyone is able to have eye-contact with everyone else. This is done to with the expectation that it promotes interaction, communication, and collaboration. My experience is that not everyone works the same, and not all work tasks are conducive to the same work environment. We have considerable feedback that the open office environment can also reduce concentration on task due to more opportunities for distraction, and thus reduced productivity and efficiency. When an open office area is required, we encourage several options for those that may have different work styles, including low-wall and mid-height walls. What is topping the “must-have” list by businesses? Flexibility in space programming is very important now. Companies of all sizes will share that having the ability to include multi-purpose space or spaces that can accommodate small meetings or large gatherings in short turnaround times is crucial to being competitive. These spaces gives businesses many options for the efficient and effective use of built space for training, marketing, brainstorming, entertaining, community outreach, etc that isn’t always possible when spaces are only designed for one continuous function. The same goes for technology. We are still bridging the wired and wireless eras and the ability to use our plethora of phones, video boards, iPad, etc. from one end of a building to the other and interconnect with hardware or A/V or building control features along the way is becoming more critical every day. Also, the quality of the work space is critical. Vibrant and open work environments are so important to having a happy workforce so we are seeing more and more awareness to the use of natural light and engagement of outdoor views or access in the design of work environments. How can good design and architecture help a business stand out? Good architecture design helps develop a brand. Business hang their signage on the façade to promote the company, the building should do the same. It can be as effective for brand recognition as a logo when well designed. When you are recruiting new employees to a growing business, nothing can be a better recruiting tool than a well-designed building that gives employees as sense of pride. How better to influence the new employee prospect than to have them impressed with the curb appeal of where they work and a well-designed, well-lit work environment. This goes just for recruiting good new talent, but for keeping your best employees. Study after study confirms that money isn’t everything when employees are asked why they stay or leave a place of work. Employees who want to give their best for you every day want to feel like their effort matters, has purpose, and the company and thus they are successful in return. I well-designed building and work environment can be very influential in achieving that result. How does a business owner know it’s time for a renovation or redesign? The only constant in business is that things change. Change requires adaptation to succeed. You see business owners renovating or redesigning their place of business to adapt to technology, or the evolution of their business model. The medical profession is a perfect example of this. HIPPA, technology, and changes in the philosophy of medical have resulted in dramatic changes in healthcare design. Many times, the employees and customers will be the first to recognize that it is time to expand, remodel or build new. Most employees by nature pursue efficiencies in their work and will be the first to observe where change or growth is needed for the company to continue to be successful. Its import when working with a business owner to determine early in the design process who the stakeholders are and get their input and involvement in the space programming. Good Architects will educate Owners on the value of integrating this programming process in the overall process of design. What are the biggest mistakes business owners make when it comes to architectural design of their business? Like good food, a well written song, or a good movie, well-designed architecture has an impact on our senses and influences our emotional experiences of the built environment. A well-designed building can be a business owner’s best advertisement or worst nightmare. Working closely with your architect to make good use of natural light, install effective and efficient lighting, heating and cooling systems, good acoustics, colors, scale, textures, etc, all influence how we experience the built environment. Many businesses make the mistake of not prioritizing a well-designed facility and lose the opportunity for their building to be the best billboard and marketing program they have. In the age of social medial, a well-designed building inside and out helps develop brand recognition among existing and future customers, and dramatically influence employee attitudes. A poorly designed building with bad lighting, poor layout, haphazard exterior appearance, and inefficient space planning will negatively impact the experience of customers, the morale of the employees, and hinder recruitment of new talent. Businesses owners make a costly mistake when they only design for what they think are today’s problems or needs without looking beyond tomorrow. If part of designing your work environment or business is to make it more efficient, more successful, and as a result grow your business, you should consider the need for more space as a result of that growth. Allowing for expansion and flexibility in the design process can be instrumental in the long term success of a business that needs to build or remodel today.